I’m strange. Sometimes I like to openly talk about a challenge or new goal, such as when I decided to draw 365 bad comics over the course of an entire year, while other endeavors are handled more privately without anyone being the wiser. In fact, I’ve already started on a few over the last several months, and some of those plans will never be brought to light. I’m okay with that. I’m the shyest man yearning for recognition, afraid to be recognized. Again, I’m strange. As far as I’ve seen over the last few days, game resolutions generally boil down to the same idea: play that game. Whether I do or not is the real challenge, and I’ve had some ups and downs over the last few years when it came to this, but I’m willing to put it out there again, a list of games I own, want to play, and then put away (in my mind). In 2013, I wanted to beat five specific games I had previously played but never saw credits roll. I ended up beating three of the five, and though my math skills leave a lot to desire, I thought that was pretty good, especially when you consider that Chrono Cross is no short romp through an alternate dimension. For 2014, I naturally wanted to beat those other two names I missed out on, but that never happened. Then I started playing Suikoden and Suikoden II, with the (laughable) idea I’d get through the rest of the series in short order now that I own all of them. Well, all except for Suikoden Tierkreis. Cue wet fart sound effect? I also had illusions of grandeur for the Metal Gear series, completing the first five games, with plenty more to go. Not “swings and a miss,” but more like “swings and good job, you’re on second base,” now waiting for another player to hit you home. I’ll get through both series in due time, hopefully before Gameageddon actually happens. 1. Stay one step ahead of Giant Bomb for its Metal Gear Scanlon feature. That means I’m not rushing through Metal Gear Solid 3: Snake Eater just yet, which is also the last of the bunch that I’ve actually played. Peace Walker, Guns of the Patriots, and Ground Zeroes will be totally new experiences to me, and I’m looking forward to them greatly, but I don’t want to burn out either on too much too fast. I enjoy watching Dan and Drew react to the wackiness that is Hideo Kojima’s mindset, but only after I’ve swallowed the crazy sugar first. 2. Since I didn’t get to them in 2013 or last year–double shame on me!–both Final Fantasy IX and Radiant Historia are first on the list of must-see-all-the-way-through items. I really don’t want to arrive into 2016 knowing those cute, cuddly critters are still clawing at my ankles, desperate for attention. 3. 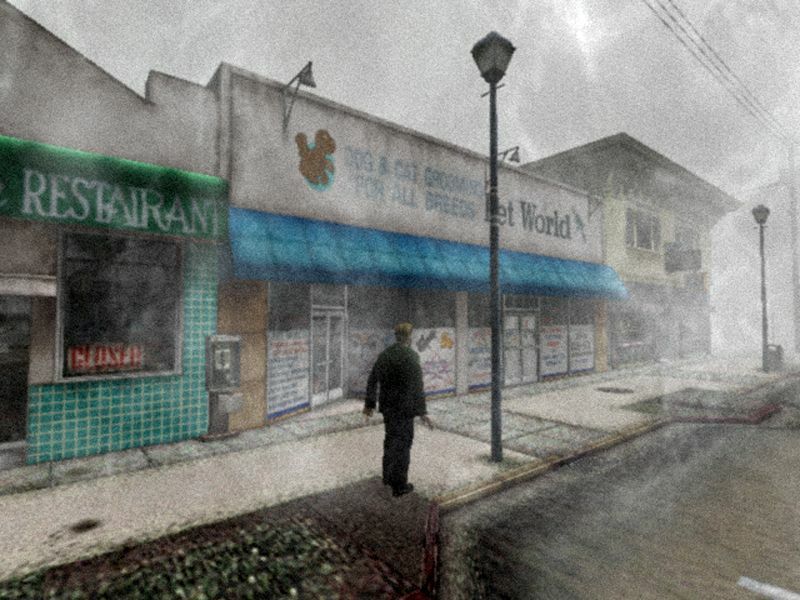 Silent Hill 3. There, I said it. Or rather, I wrote it. Even though I’m still not over my harrowing time with Silent Hill 2, I must persevere. I’m not ready to explore why. 4. Come up with another new feature at Grinding Down for the year. Games I Regret Parting With seems to be a big fav, but I’ll eventually run out of those to dissect. I used to do Achievements of the Week and Half-hour Hitbox, but those lost steam after awhile, mostly because I lost steam. If you have any ideas or niches you’d like to see my cover, y’know, other than all these unheard of freeware joints or obscure point-and-click adventure games, let me know. I’m interested if you’re interested. 5. Get proper equipment like a microphone and learn how to stream better in preparation for the next Extra Life event. I want to do it again and have friends over and raise lots of money for those that need it more than me. I’m even hoping to hold out on several games still in hopes of playing them live that during those twenty-four hours. All right, we’ll stop there. Resolutions are tricky because you can just keep stacking them, and like I said, for gaming stuff, it often ends up being a list of games you want to play. I have too many to even start counting, and most of them are long, lengthy JRPGs, like Atelier Iris 2: The Azoth of Destiny and Xenosaga. Cue mad scientist laugh? Yeah, cue it hard. What are some of your new year’s resolutions, gaming-related or not? The Chrono Cross soundtrack is simply legendary. I’ve been listening to it for years and have certainly spent more time nodding along and tapping my foot to tracks like “Termina – Another World” and “Fragment of a Dream” than actually playing the game, which, for those curious, took me just under 40 hours to see to completion. That’s saying a lot because, to drop some truth bombs here, I dislike a lot of videogame music, especially a lot of 8-bit and 16-bit stuff. It all sounds too–and forgive the phrase here–videogamey for my tastes. When I want music, I want music–strings and soaring climaxes and tempo changes and so on–and composer Yasunori Mitsuda delivers the goods seemingly effortlessly, drawing on old world cultural influences and alternating between bright and dark themes. I’ve actually touched upon the game’s soundtrack before, back when I did a 30 Days of Gaming meme thingy. Remember that? Of course you do, ya loyal, devoted reader who I haven’t yet scared away with all my Chrono Cross jabbering this week. Anyways, here’s a link for the lazy. I will now try to think of some other things to talk about. Over the many years of my preponderant existence, I’ve come to appreciation a couple other videogame soundtracks, but not many. Dark Cloud 2 has some solid tracks and ranges from dark, unsettling and nearly off-putting carnival-like songs to slower, prettier pieces like “Starlight Temple” and “Veniccio Coast”. Radiant Historia came with a bonus CD, as did Shin Megami Tensei IV, which I burned onto my computer and listened to a few times. And then there is Fez and Bastion, the two most recent examples of game soundtracks I’ve found myself listening to and enjoying separate from the time I spent finding cubes and shards, respectively. Supposedly Journey has a great one too, but I’ve yet to play it (though I do own it now thanks to a recently stellar sale on PSN). Other than that, a lot of music in games these days is kind of forgettable; certainly it does the job of setting the mood and blocking out background silence, but it only exists for then and there, never meant to be listened to again, unless you play that part over again. I love that, for every town and place you visit, there are two themes: one for Home World, one for Another World. Some vary quite differently from one another, while others are strikingly similar. 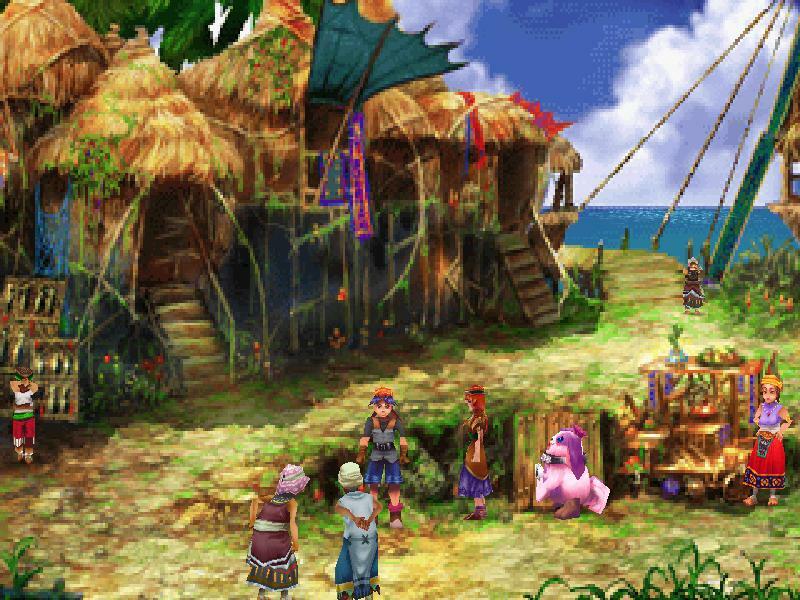 Take, for instance, Arni, the first town–well, it’s a fishing village if you want to get specific–that players will experience in Chrono Cross. In the Home World version, you can almost hear the waves crashing against the docks, feel the sea-carrying wind against your face, and be quite content with the day, as the song is both pretty and peaceful, perfect for running around and talking with your neighbors. 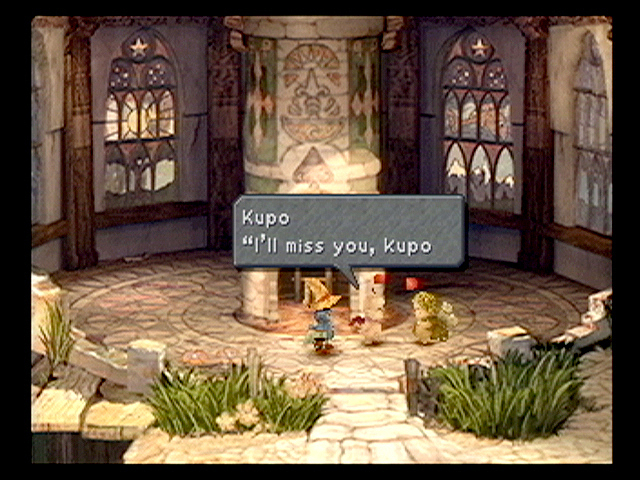 In the Another World version, a piano riff takes center stage, playing nearly the same guitar part found in the Home World version, but this time it is slower, softer, maybe even a little unsure–which reflects perfectly on Serge because, at this point, he has now traveled to a different realm where he no longer exists and is looked upon as a stranger. The music pairs up like this in a couple other spots, but this is my favorite. Thankfully, the battle music never really grows old after hearing it a couple of hundred times. I can name some other games where I’m sick of hearing the same battle theme minute after minute after minute: Ni no Kuni, Dragon Fantasy – Book 1, and Kingdom Hearts. Sometimes, a few battles are fought using drastically different songs, but for the most part it’s the adrenaline-pumping, button-pushing beat of a truly epic battle theme. 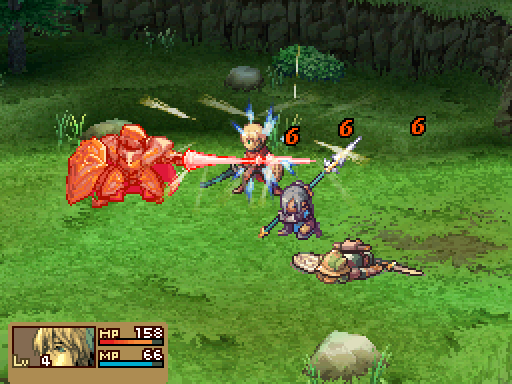 Granted, it pales in comparison to Chrono Trigger‘s battle theme, but that kind of isn’t a fair fight. It’s difficult to find something to truly dislike about Chrono Cross‘ original soundtrack; the entire compilation isn’t perfect, as some songs are too dreary to handle, but it is brimming with a sense of hopeful continuity, and that reminds me greatly of a large bedroom, once my sister’s, where I’d sit on the floor in my pajamas on a gloriously sunny Saturday afternoon, just a foot away from my television, slotting Elements and listening to this strange, colorful world, feeling somehow right at home. It stirred me then, it stirs me now, and it will continue to be an important part of my life, no matter which realm I end up in. Monster Tale is an adorable Metroidvania game that, if the Internet is to be believed, comes out today on March 22, 2011. A few months back, I originally saw a projected release date of March 1, 2011, and when that day came and went without so much as a Monster Short Story, I tracked down some peeps at Majesco Entertainment and asked them if they could kindly spoil the release date as all the Internet was then saying was some time in March 2011. The nice peeps at Majesco were nice and got back to me, but they could only confirm that the Internet was to be trusted. A couple days later I noticed that both GiantBomb and IGN had updated their respective pages to indicate that today is Monster Tale‘s day. Alas, I’m not going to rush out to the stores later and see if it’s sitting high and mighty on their NEW RELEASES shelves for several reasons. 1) I busted up my back golfing over the weekend and cannot physically rush anywhere 2) I’m still plugging away at several other Nintendo DS games, namely Pokemon White and Radiant Historia, which both require devotion and time 3) and lastly, the nice peeps over at Majesco Entertainment asked for my mailing information after I emailed them so that they could put my on the request list. What does that mean? I don’t really know. But maybe they took a look at my blog and liked what they saw and want to send me a copy to review. I’ll wait a few days to see if anything arrives, but if nothing comes by the end of the month, I’ll most likely go grab a copy so that I’m well stocked for my MoCCA trip to New York City the second weekend of April. Right. Diablo II on a console, but much more cartoony and fast. I’m digging it, and normally by now I’d have written up some early impressions of the title, but the truth is that I’m almost at the end, meaning all my big boy thoughts will have to wait for the final review. Still, I like a lot of it except for one big caveat–the tiny font size. And when a game stands on a mechanic such as loot, being able to read and compare magical spears is vital. I’m pretty sure I’ve sold a lot of excellent gear simply because I couldn’t read what it did or its requirements for wielding. Only have two gym badges so far, but that’s okay. It’s not a race, no matter what my rivals say. I like finding a good team of ‘mon and then training them to be, roughly, around the same levels. Right now I’m rocking Victini, Snivy, Timburr, and Audino, and the other two spots haven’t been truly filled yet. I’m giving that trash bag Pokémon a chance though since many others probably won’t. Its Sludge move is pretty good. But man, oh man…it’s a trash bag? I was stuck for awhile in this one, unsure of which timeline node to jump back to, but Greg Noe steered me in the right direction. Now I’m working my way through the Closed Mine in hopes of learning a sword dancing move from somebody to help Stocke progress with a circus act in the alternate timeline. Yeah, it can be a bit confusing. Still, the combat is fantastic. Really do need to schedule more time with this one. Started this on a whim, and have only played a wee bit of it, but I dig its mood and atmosphere and the way opening a drawer feels. Seriously. It feels good, true, like I’m actually doing it myself and not with a mouse. I would have loved to see this technique used more in games like Fallout, as it makes searching a room actually feel like searching. There’s a special kind of warmth that comes from opening countless empty drawers and then opening one to find batteries there, yours for the taking. Every week, usually Friday, sometimes Saturday night, Tara and I go visit her brother to play some videogames. We call it “games night,” and we focus mainly on all things Wii (but I swear to teach him Munchkin before too long). Wii Sports Resorts is so much fun with a good group, but two players had to share one remote, and I got tired of this after several weeks. So I purchased FlingSmash, which is basically a Wii MotionPlus controller ($40) with a game thrown in for good measure ($10). The game is just an excuse to shake the remote around, but I hope to examine it more closely soon. Whew. Too many games. There’s the possibility that I’m not even writing about more. Also, a friendly reminder that by the end of this month I’ll also be picking up Monster Tale and a Nintendo 3DS…so yeah, more to come. Woe is me? Naaaaaaaaaah.